Antelope Point Marina is located 12 miles from Page, Arizona, and just a few minutes from the Glen Canyon Dam and nearby Wahweap Marina. Antelope Point offers convenience and brand new services catering to past customers and newcomers. Antelope Point Marina has unsurpassed guest services and amenities. They offer an expansive unloading zone for your convenience, 24-hour security and courtesy cart service to transport you to and from your houseboat. 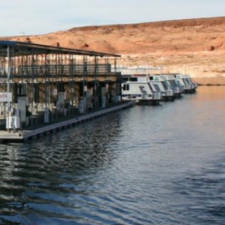 Antelope Point Marina is the closest land-accessible marina to one of Lake Powell's most popular destinations, Rainbow Bridge National Monument.